This sale is for ONE brand new CEM DT-616CT CE certified 2-in-1 digital non-contact infrared thermometer with built-in laser pointer and humidity meter with detachable sensor. This sale is for ONE brand new CEM DT-616CT CE certified 2-in-1 digital non-contact infrared thermometer with built-in laser pointer and humidity meter with detachable sensor. 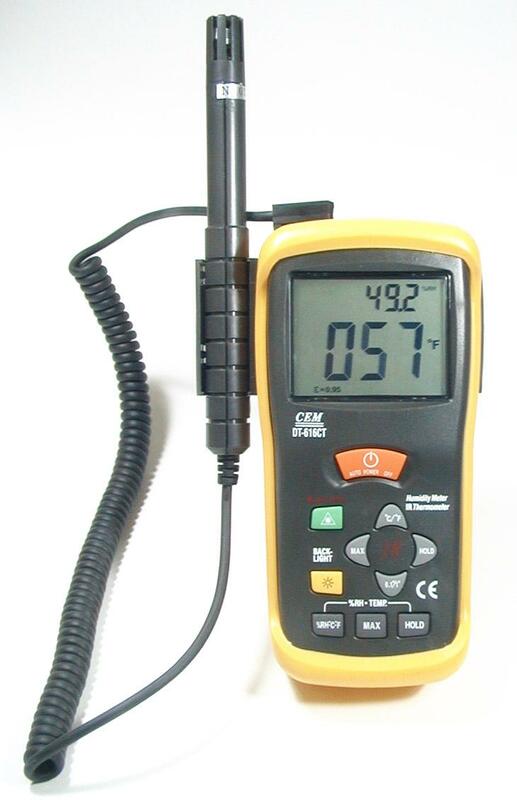 This 2-in-1 meter has large 4-digit back-light LCD display and a smaller size display that can show both temperature and humidity at the same time. Forget about the old analog devices, this newly designed digital light weight device gives you long lasting power with accurate measurement from safe distance. The build-in laser pointer helps you aim better at the object for a better result. This 2-in-1 meter can reduce your burden when traveling. It also comes with a heavy duty pouch to protect your device when working in the field. * Super Large 4-Digit (1999 count) for temperature display and a smaller 4-digit (1999 count) for humidity or temperature display. * Display: 0 - 1999 count.